One of the most common things that successful Etsy Sellers say is that their Etsy Sales have gone down drastically. We've experienced the same exact thing as well. In some of our Etsy Shops, our sales of gone done. But in others (especially the newest Etsy shops we have), our sales have gone up in 2019. If you're Etsy Sales are Down in 2019, here are some things to consider on how to work around the dramatic changes in Etsy. Remember that you are not in control of what Etsy does with their platform. Their 5% hike increases, their ever-changing algorithm experiments, and their tendency to disregard small artists and focus on their shareholders are all things that Etsy Incorporated is focused on. In order to work around all of those major shifts that Etsy is doing (because they are a large publicly-traded stock), you must learn how to use these changes to your advantage. Make new stuff. If you have been selling the same things as 2015, 2016 and 2017 as now, one of the reasons your sales are likely down is because you have not changed strategies and starting selling other kinds of products that people want in 2019. You must always continue to be ahead of the curve and develop new things that people want, but not a lot of other people are making. Don't rely on Etsy's Algorithms. Etsy Algorithms seem to change like crazy more than ever, and not in a good way. Their unreliable algorithms cause instability in the day-to-day searches of customers. The best way around this is to sell products that have high demand and low supply. It's hard to figure this out, but doing a lot of research on selling products and focusing on niche, under-served keywords is the best way to keep getting a lot of visibility on Etsy. Look for niche keywords that no one else is using and focus on capturing small audiences, not big vague keywords like "jewelry" or "dress" or "art", but instead things like "black and white vintage dresses." Take control of your own Marketing. Think about building your own website and doing your own marketing. Etsy is the best place ever to start a new business and get sales quickly. But once you hit 1000 sales, you should start thinking about how to create monthly stability, and that's by taking control of your own marketing, collecting email addresses with Mailchimp.com, building your own website on Squarespace.com, and drive business to you instead of rely solely on Etsy. There is so much opportunity on Etsy, but you have to do it right. Don't sell what everyone else sells. Instead, stay ahead of the game a be a leader in your niche market. Have your sales been down in 2018 & 2019? What kind of issues have you seen with selling on Etsy lately? Share your comments below. Why Does Etsy Keep Changing Their Algorithms? This is a common Etsy Seller question: Why do Etsy's Algorithms change so much? There is a lot of talk about how Etsy changes it's Algorithms all the time. After reviewing data on the 6 different shops we have on Etsy, I do believe that Etsy does a crazy amount of changes to its Algorithms, some times on a daily basis, and often times with the strangest and illogical results. It seems as though they are frantically testing out new ideas on how to organize search results in order to increase the overall sales on Etsy in general, but not necessarily your own Etsy Shop specifically. This means that good Etsy Sellers that have a track-record of doing well on Etsy can easily be hurt by these rapid changes in Algorithms. That's why it is so important to have a long-term plan of building businesses on Etsy but then thinking about how to start your own website, collect email addresses, do other marketing online and so on. What can you do about Etsy's Algorithm changes? Honestly, not a lot. You are on Etsy's platform, and it's their choice to make changes. While I find Google's SEO changes logical, Etsy doesn't seem to have the same levelheaded approach to showing search results in a methodical way. First, focus on making great products for your customers, and pairing them with practical keywords. There is still a lot of opportunity to use Etsy as a place to prove your business concept and hit your first 1000 Sales. Once you hit 1000 Sales, you can start thinking about building a website & doing other online marketing to grow your business on your own terms, with more control. But until you get to reaching 1000 Etsy Sales, just know that you are at the whim of Etsy making lots of changes to their search result systems, and that the future of your own business is in your hands. Continue to learn about business principles, and educate yourself as much as possible so that your income doesn't solely rely on Etsy. There are a lot of ways to bring people to your Etsy Shop. You can try Social Media, ads on Facebook, or Etsy's Promoted Listings, or develop a strong following on Pinterest and Instagram. And in some cases, those strategies might work great for your Etsy Shop. But having strong keywords on Etsy is always going to be the best strategy to bring people to your Etsy Shop. When people are on Etsy browsing around, they are already in the mindset to buy something soon. There are only a few other websites that do the same thing, such as Amazon, Ebay and Yelp. But when people are on Instagram or Facebook, they are looking to socialize. And when they're doing a Google Search, they are most likely looking up information - not necessarily to buy something. On Etsy, people are browsing around looking to buy something soon. It may be that they want to buy something right now, or they're planning to make a purchase within the next few days. And the main way they find something roughly similar to what they're imagining in their mind is to type in a couple of keywords to see what comes up in an Etsy Search. The trick here is to choose the right words that Customers try typing in and then match your Etsy Listings accurately to those keywords. Some keywords work better than others. Even if you have good keywords and you show up high in search results, your product might not match those keywords very well. And so no one ends up clicking on your Item. But if you match the right Keywords to the right Etsy Listing, then you'll end up lots of views for that item. And the more views you get, the more likely you'll get a sale. And every time you get a sale, your Etsy Listings gets bumped up higher in Etsy Search results. And you'll continue to get lots of great benefits from having good keywords, views, and sales. So it's absolutely crucial to choose the right keywords for each of your Etsy Listings. If any of your Etsy Items are getting less than 5 Keyword Searches within the last 30 Days, then you'll likely need to work on improving those keywords to get more views. It could take you weeks to find the right keyword match. So if nothing works within the next 7 days, try some brand new keywords again, and repeat the process every 7 days until you start to get some more views through Keyword Searches. Simple words are always better than complex, unique words. Make sure to use commas to separate keyword combinations. Two-word and three-word combinations tend to work best. They're not too generic, and they're not too specific. Never stop thinking of brand new keyword ideas that you have never used before. There are always, always, always new keywords you can try. You can even look in a dictionary or some random place to help you try to be inspired by brand new keyword concepts. Every day, I always encounter new keyword ideas I never even imagine would have worked before. Try to get at least 15 Keyword Views to an Etsy Listing within the last 30 days. Usually, items with 15 Keyword Views have about 100 Total Views in the last 30 days. And, on average, you should be getting a 1% conversion rate, which means you should aim to get 1 Sale per item per 30 days. This is just a general rule of thumb, but it's a really good standard that's realistic that you should try to aim for. Keep at it and always work on your Etsy Shop. And never forget that Keywords should be your number one area to totally master on Etsy. Etsy's CEO, Josh Silverman, put out a video yesterday highlighting the changes Etsy is working on to help Etsy become a better place for people to shop online. Overall, I am encouraged to hear that Etsy is taking their platform seriously by developing tools and creating changes that are more likely to better compete with companies like Amazon, by encouraging more discounts & promotions, the ability for customers to filter through search results, and get access to high-quality listings that will encourage visitors to keep coming back to Etsy and make more and more purchases. Below are 2 Big Takeaways that I see will be very important for you to think about and actively work on in light of what Etsy announced on December 6, 2017. This change is huge, and is surprisingly what I thought was actually happening earlier this year around March of 2017. Etsy's CEO gave an example of a "Laundry Basket" keyword search before and after the CSR changes were implemented. The images below are not the same as the presentation from the video, but roughly similar. Before, if you typed in "Laundry Basket" a lot of the results would have been printable art or printable stickers, or things like that. 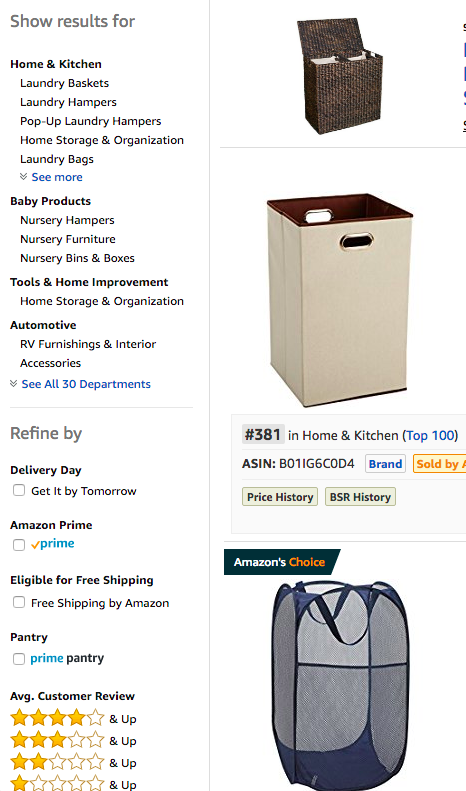 Now, if you type in "Laundry Basket" today you'll get results that are more likely what you meant, meaning physical products of Laundry Baskets. While this is bad for shops that offer Printable items, it is definitely better for the average visitor's user experience. Most likely, a visitor typing in "Laundry Basket" would have meant that they were searching for a physical product. The way Etsy does this is by likely having a very large list of keywords that they associate with a "Category", such as "Physical" or "Digital." So that instead of a customer typing in "Physical Laundry Basket," which would be strange and redundant, they would only have to type "Laundry Basket" in order to get the result they wanted. Because of this change, it's very likely that most Digital Download/Printable Etsy shops have seen a huge drop in their sales, unless they have worked to incorporate more physical products or worked on newer keywords that are more niche and less competitive. And some physical product shops are likely seeing some increases in certain categories, although I am sure physical shops are seeing some hurt from this as well, depending on what you sell. 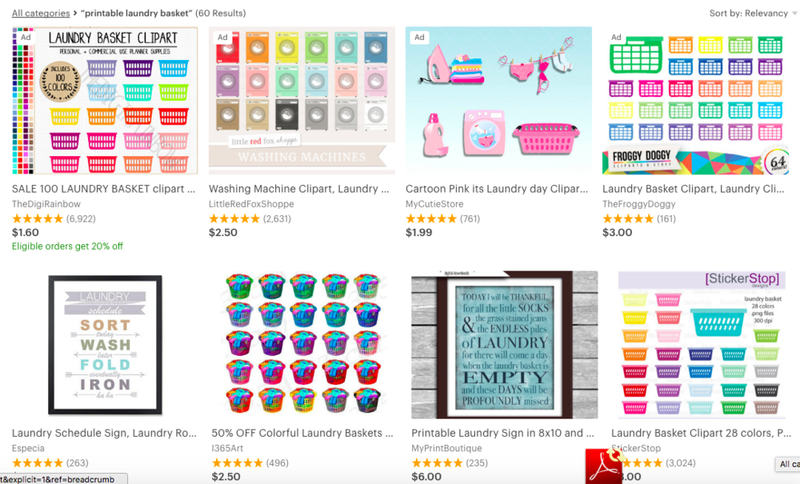 For instance, if you sell "Vintage Laundry Baskets" you were probably also effected as well, because Etsy is going to likely feature new and popular Laundry Baskets, instead of niche categories. This is a huge change that, unfortunately, is going to negatively or positively change your Etsy business is some way. The Etsy CEO, Josh Silverman, made it clear that lots of changes will be happening to Etsy Search and keywords. He also made it clear that "keyword searches" are still the number one way people shop on Etsy, which makes it incredibly important for you to continue to learn and implement keyword strategies. Unfortunately, we do not know what changes Etsy plans to make in the future. But we can make educated guesses on how to improve our Etsy Shops right now in order to prepare. The main announcement that Josh Silverman made regarding search changes is a "Less Focus on Titles." 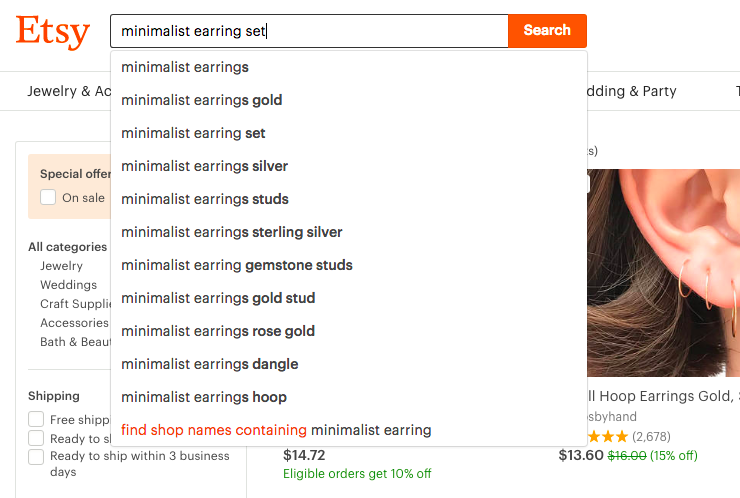 Right now, Etsy's searches rely on a very old search algorithm called "keyword cramming" where you just stuff as many keywords as possible into your Titles and Tags. I have felt for a lot time that this will eventually change. And Josh Silverman is making it pretty clear that this will definitely change in the near future. It will likely be more sophisticated to what Amazon and Google do with their searches, which is give you the best selling items, allow you to better filter through keyword results based on price, color, category, free shipping, and other important options. For instance, take a look at the left-hand side column for "Laundry Basket" Etsy searches in the image below. On the left side, you can see options like "On Sale", Category, Shipping & Lead Times, as well as Color. Compare this to Amazon, which allows you to also filter by Category, Delivery Day, Amazon Prime/Free Shipping, and Average Customer Review. As Etsy continues to refine the left-hand sidebar, customers will most likely start to use this frequently. The Etsy CEO make it clear that the new changes regarding shipping/lead time, free shipping, and sales have significantly increased an Etsy Customer's ability to shop and find what they want, just as if they were shopping on Amazon. 1. Continue to expand your product line on Etsy into new categories. As things change, you want to have stability on Etsy by offering items to a wider range of customers. This way, as things on Etsy change, you can be better prepared to adjust. For instance, if you currently sell Digital Downloads only, consider how you can expand into Physical Products as well. If you only sell Vintage items, consider also selling newer or modern items as well. 2. Write quality listing descriptions with good keywords. Both Google and Amazon pull keywords from an entire product page when indexing the keywords they will use for a search result. In the past, Etsy has only used Keywords from Titles and Tags. But Etsy will not stay that way forever. Etsy has been way behind the times in terms of their SEO search result quality. For future listings, write quality Listing Descriptions that will incorporate more keywords that are highly relevant to what you are actually selling. For instance, the Category, Primary Color, and Holiday/Occassion are all going to be more helpful for people in the future to help them find what they are looking for as Etsy continues to focus on filterable searches. Etsy's CEO made it clear that Etsy shoppers are no different than Amazon shoppers when it comes to shipping and good prices. Etsy customers want their orders to arrive quickly, and without having to pay extra for shipping. Changing your processing time down to 1-2 business days, and building your shipping costs into your item's cost is going to greatly help you increase your sales as Etsy continues to promote the shops who actively offer those kinds of options. This also goes for options like Gift Wrapping or other shipping incentives. Over the next few months and years, Etsy is going to change quite a bit. But I think these changes are for the better, especially if you can take advantage of all the changes they are doing. I can tell that Etsy's goal is really to rival and get up to speed with Amazon. Amazon is a place where people can find basics like toilet paper, toothbrushes, cheap dinner plates, and so on. And their Amazon Prime option has made them the most popular tool for online shopping. But not everyone wants mass-produced, cheap items. Today, Etsy is still the best place to find unique, handmade items that you cannot find anywhere else. Which is why I am excited to continue to grow my own business on Etsy. Strong Etsy SEO keywords are absolutely essential in order to have a successful Etsy Shop. Here are 4 of the most important techniques to use for creating strong SEO keywords on Etsy. One thing I did when I first started an Etsy Shop was used creative and unusual words to describe my artwork. Things like "Abstract Series No. 24" as a title for your Etsy item is extremely poor. Instead, use keywords like "Abstract Art, Minimalist Decor, Modern Paintings, Black and White Artwork." You want to use simple words that your customers will actually type in to find what they're looking for. Etsy organizes listings by how you separate them. You want to split up your keywords into chunks of one, two, and three so that your Etsy Items are prioritized higher than other Etsy Shops' items. So instead of writing a Listing Title like "Black and White Modernist Artwork Painting For Modern Homes", split it up into pieces, like "Black and White Painting, Modernist Artwork, Modern Home Decor." This way, you'll rank higher in most cases for simple keyword combinations. The more keywords you can use, the more opportunities you have for being found on Etsy. Make it a habit to always completely fill up your Listing Description's Titles and Tags. At first, it will feel tedious to have to do this, but it's going to have a drastic effect on your ability to be found in Etsy. Something I see Etsy Sellers do constantly is reuse the same keywords over and over. If you sell mostly "Leather Purses" on your Etsy Shop, do not use the keyword "Leather Purses" on every single listing. Instead, mix it up as often as possible with other keywords like "Brown Purses, Leather Accessories, Leather Fashion, Purses Leather, Simple Purse, etc." Always, always, always think of new keywords and keyword combinations, and different keyword orders for your new products. The more variety of keywords you have, the more you'll be found on Etsy. In my opinion, Keywords are the easiest way to get new customers on Etsy. Because buyers go there when they are ready to purchase something, Keywords are the first gateway to allow those customers to find you quickly. But in 2017, there is now more competition than ever on Etsy. So instead of going after the big, general keywords, you should be focusing on your own niche. There are thousands of shops that sell jewelry, printable art, and other big categories. But that doesn't mean you can't go after those markets. It just means you need to find your own sub-niche space and stand out. Think of two, three, and four-word keyword phrases that give you only around 500 to 5,000 product Results once you type them into Etsy. Make sure this phrase shows up as a suggested "keyword phrase" by Etsy. The keyword will dropdown automatically from the search bar. This way, you know there is at least a decent amount of traffic coming from that keyword. If it doesn't drop down, then there is likely a very low search volume from that keyword. Next, decide if you can easily make a product based on that keyword. If the idea is going to take too much time and money to create, then drop it. But if you can easily knock out the idea within a day and it's not going to cost you much money, then it's likely worth pursuing. A good rule of thumb is to make something that you can re-sell for 10-times more that the materials you made it out of. So if it costs you $10 USD in materials, you should be able to re-sell it for $100 USD on Etsy. Time is important, too. You want this to be something you can make in only 1 or 2 hours of time. Finally, get the product up on Etsy asap. If it takes you more than 1 or 2 days to get the item up on Etsy, then you may need to simplify your design process to something more realistic. Simplify your steps, come up with an idea that you can more easily achieve, and move forward with. The goal here is to get used to the creative process by turning out designs as quickly as possible. Then, get used to coming up with new product ideas. The more ideas and keywords you can find, the more stability you can have on Etsy. To help you follow this process, I put together a printable PDF that you can use to write out your Keyword Ideas, and then re-write the ideas that seem the most realistic.